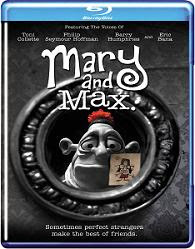 Mary and Max is an animated film coming from the Academy Award winning Australian director Adam Elliot. Whereas his Oscar statuette has been in the category of Best Animated Short Film for 2003's Harvie Krumpet, Mary and Max is his first full feature animation. But contrary to any expectations for an animated movie, this one is not targeted toward children. The film examines mostly adult subjects and although there is not much content inappropriate for kids, it is not a motion picture that will satisfactory entertain the majority of children. Mary and Max naturally tells the story of Mary and Max. She is Mary Daisy Dinkle (voice by Toni Collette), a friendless 8-year-old girl living in Melbourne, Australia. He is Max Jerry Horovitz (Philip Seymour Hoffman), a lonely 44-year-old man, living in New York, severely overweight with often anxiety attacks. Mary has an alcoholic mother and a not entirely normal father. And Mary loves chocolate. Max has trouble sleeping, enjoys entering the lottery, visits Overeaters Anonymous meetings each Thursday and has a strange, almost blind, neighbor-woman. And Max adores chocolate. It all starts in the 1970's when Mary picks a random name out of a Manhattan phone book in order to find herself at least a pen pal. And of course, this is Max. Thus, a 20-year long friendship and correspondence begin. Although following an unlikely relationship between a child and an adult, most of the time Mary and Max goes into more mature topics even if some of them are presented through a child's eyes. Alcoholism, severe obesity, loneliness, love, panic attacks, madness, self-isolation, Asperger’s syndrome, loss, misunderstanding, lack of tolerance, suicide are just a few of the subjects touched in this movie. Most of the problems are just exhibited without any solution to be offered. But there are so many issues referred that even gathering all of them in a single film, makes the effort worthy of praise. Mary and Max successfully manages to capture the existence in suburban Melbourne and even better to present the spirit of New York. These are often depicted through Max and Mary's naive minds but their simplicity just makes the pictures more moving. The use of muted color schemes for both worlds also helps a lot. Mary's universe has an overall brown touch, where Max's world is portrayed in grey. There are only occasional appearances of more color in a few episodes when something important or interesting has to be underlined, e.g. red lips, brown chocolate or a red pompom. Having in mind all unhappy topics the movie concerns, it should be expected that Mary and Max is dominated by a feel of helplessness, isolation and misfortune. And it is. But there are also funny moments and much of the letters between our two main characters are written with a touch of subtle humor. You'll find yourself laughing plenty of times although the substance of the lines you hear is not comical at all. Independently of the occasional grins, at the end of the film it's hard to be in anything else than a sad mood. Mary and Max is both beautiful and melancholic. It's visually interesting. The work of voice artist (mainly Toni Collette and Philip Seymour Hoffman) is fantastic. The music is also a great match. The movie is not so full of sorrow as, for example, Grave of the Fireflies is, but nevertheless, Adam Elliot's debut full feature effort is among the rare cases of animations leaving you with uncomfortable feeling after their ending. So, if you enjoy watching profound animated films, you should definitely give this movie a try. Examine our maze of reviews to read more movie reviews and articles.